Going back to school can be a very confusing time. Everyone feels a little groggier and discombobulated until there is a good rhythm established. It might not be a tele-porter but these easy breakfast casseroles could make the morning smoother. So while you’re trying to make sure your kids head out the door with at least matching shoes and brushed hair, don’t let rumbling bellies throw your whole morning off. Making breakfast ahead of time can make mornings just a little bit easier. Whether you’re heading to the office or back home to take care of littles, you deserve something filling and healthy too. Some easy breakfast ideas include protein muffins, frozen breakfast burritos, and overnight oats. These make ahead breakfasts make your morning much calmer. Breakfast casseroles are a great make ahead option. (They’re one of my favorite ways to use up leftover vegetables too.) They can be made on Sunday and last all week. They can be sweet or savory, full of vegetables or packed with bacon. You choose what will fit your family best. I take a piece, cover with moist paper towel, and reheat for about 45 seconds in the microwave. I usually break my larger piece into smaller pieces so it gets warm throughout. 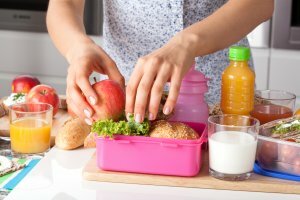 Science shows us that kids who eat a low-glycemic breakfast (i.e. mix of the slow burning fuel like protein and complex carbohydrates) can focus better and perform better academically (Source). Don’t forget these the rest of the year too. A make ahead breakfast casserole is perfect for holiday mornings so you’re fueled for your afternoon of cooking. I’ve always struggled to work vegetables into my breakfast. But adults should get about 3 cups of veggies per day (Source) so working them into breakfast is a good start to your ‘three a day’. Mushrooms and spinach are great additions to casserole since they pack a lot of nutritional punch without messing up the egg to filling ratio. 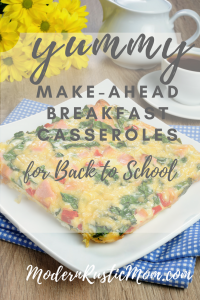 So many breakfast casseroles rely on biscuits and other wheat ingredients that it can be hard to find a good gluten free breakfast casserole. You can save even more time with pre-shredded cheese for this recipe. I also like the additional of sour cream that lends some creaminess. It can be tough to find a vegan casserole that is still filling and tastes good. This one will do both. The yummy kale and filling cashew “cheese” transforms the hash brown potato base into a healthy breakfast recipe. This is for all you bacon lovers out there. We have several at our house. There is something special about bacon with breakfast, no matter how often you have it. It could use a vegetable or two to up the nutritional power but it sounds really yummy easy recipe. Easy breakfast casseroles are a healthy pre-made breakfast. They won’t make every morning perfect but it may help you get at least a sip of your coffee before it gets cold or you forget your travel mug on the counter. What do you do to make back to school mornings easier? Are your school days stressful or pretty smooth? What do you do for breakfast? Let me know in the comments!